Beds were moved out on to the terrace in all weathers, as shown above. This was so patients could benefit from the fresh mountain air. In snowy conditions, rubber blankets were put on the beds to give some protection against the snow, sleet and rain. 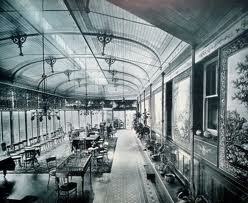 This was once a conservatory for Adelina, with fine furnishings, plants and drapes. 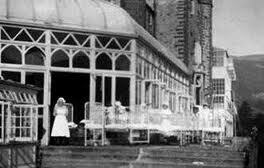 Later this was the children's ward and a great many would have died young, in this room. Ghost hunters have picked up on the sound of children here, though this room is not often used in our ghost hunts today. The picture top left left shows the Conservatory in use probably as a dining room in Patti's later years at the castle, with the original ceiling 'lantern' intact, while above and lower left you can see the Conservatory in use as a Childrens Ward, with the small cot-beds for the children and the beds out on balconies outside. Ghost Watch investigators under Bill Harrison identified this area as being a very sad area, hearing babies and young children crying out. This last picture (bottom right) shows one of the covered terraces that would have been further along from the Conservatory, leading off what is now the Patti Bar and main function room.